Get your local award-winning arts interview podcast fix in our latest ep as we cover TWO new theatrical production premiering in Edmonton. Take a walk into two dark and challenging worlds with Northern Light Theatre’s WISH – a love story about two different but alike beings; and Theatre Network’s tale of desperate criminals in GORDON. We chat up the full cast from each production about their shows, the process and other random bits of good conversation. Ainsley swears a lot, Mari dishes the Arts News and Chris W. Cook says some things. 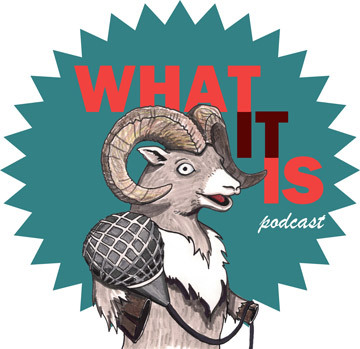 It’s another 2 interview ep of the What It Is podcast! Now get it in your award-winning ear holes!